May 13th, 1940, morning. Mouzon is a French Major Supply Depot. Reinforcements will spawn in the bottom left corner. Currently the French 5eRDP BG (AI) pinned down by PzRgt.1/1Pz on in that small corner. Morale is on and the battles are set at 15 minutes. You own all the commanding features including the two story house next to thier deploy zone. You have full LOS everywhere. Keep the battlegroup pinned in the corner. The AI can have the bridge, but not the North end of it. The two story house is a bonus, but you don't need it. Take some some armour or anti tank guns to cover the North end of the bridge from vehicles. You will be mostly static in this fight. The units you should focus on bringing are mortars, MG34s, only two command teams (left & right flank), an anti tank or inf gun and remainder riflemen. Keep in mind this battle is vs the AI with morale on. To disband this unit you will not need to capture the VLs. A straight up firefight across the river will drop his morale significantly enough to push the AI off the map. The bonuses to this are not in your favour except the fact he loses all 15 units. Next reinforcement phase he will regain the full attack square deployment box. You will be pushed back beyond some of the houses covering the bridge. On this particular map, keeping him on the map whittling his forces down piecemeal every battle is in your favour. Your forces get to stay in cover all the time, while he has to march forward on pavement. You only have to concentrate on covering the North end of the bridge. You may have to capture the bridge VL to push his deploy back every now and then. Doing this you have to be careful of his morale. Keeping your men on ambush the entire time and only opening fire on the men coming to the North end of the bridge is key. If this battle was vs a human opponent your tactics will have some changes. First of all morale will most likely be off, so to disband him you will have to capture the VLs or destroy every last man. This is also not in your favour. In this example, its only day two of the entire campaign. 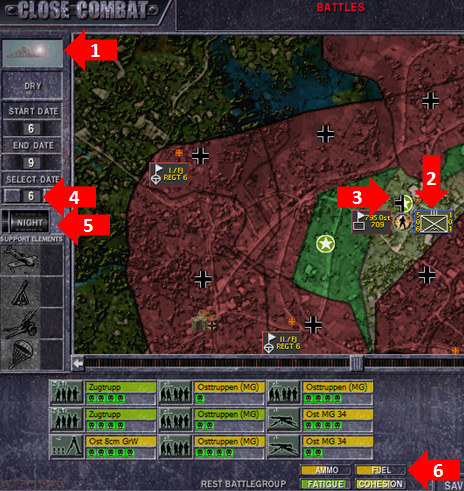 You have to let your unit sit and eventually die (due to attrition) on this map to hold him in that corner. This tactic could also force your opponent to disband his unit at the strategic phase in order to get a better start when a new unit spawns. Manually disbanding works out in your opponents favour in this case. In Disbanding Part Two, we'll go over the differences in disband rules from CC5 to TLD and the best ways to make disbanding work for you throughout a campaign. There are major differences due to this rule being fixed for The Longest Day.